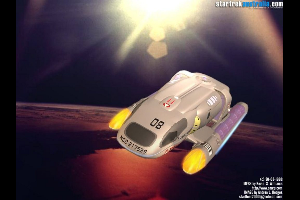 The WaveRider Type shuttle is designed to facilitate close quarters examination and survey of planetary bodies by science personnel aboard the ship. Unlike ordinary shuttles, the WaveRider does not enter the ship's Main or Auxiliary Shuttle bays; instead, it inserts itself into a recessed docking port on the outer hull of the ship. Access to the WaveRider is provided by a hatchway inside the ship and a ladder-equipped hard umbilical.